Chop leftover chicken (or use a rotisserie chicken) until you have about two packed cups of diced chicken. 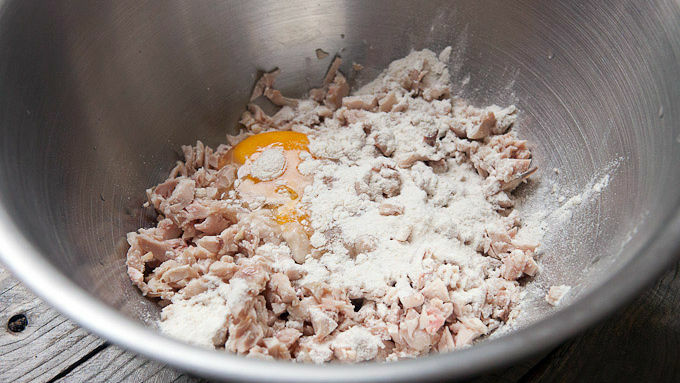 Combine chicken with the egg, 1/4 cup all-purpose flour, 2 tablespoons chicken stock, and salt and pepper. The mixture should be tight enough to hold its shape if you press it into a ball. For breading, whisk eggs with milk. Separately, stir together flour with paprika, baking powder, baking soda and salt. For sauce, microwave all the ingredients for 20 seconds on high and stir to combine. Set aside. 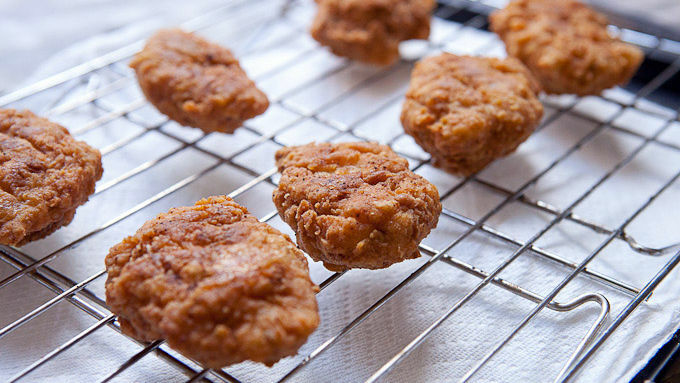 Shape a heaping tablespoon of chicken mixture into an oblong nugget and dip it in the flour mixture to dry it out. Then dip it in the egg and milk mixture, and then back in the flour mixture to coat it well. Set the coated boneless wing on a wire rack and continue with the remaining wings. When all the wings are prepped, heat a few cups of oil in a large, heavy skillet. When the oil reaches 350°F, fry the wings in batches for about 3-4 minutes per side until they are nicely browned. When wings are done frying, let drain on paper towels and then toss immediately in the sauce. 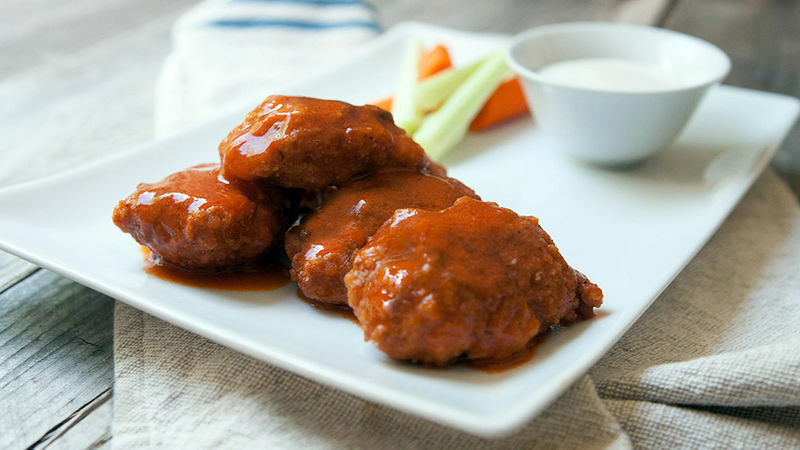 Serve wings while hot with celery, carrots, and blue cheese dressing on the side. If the chicken mixture is too wet, feel free to add more flour until it firms up. 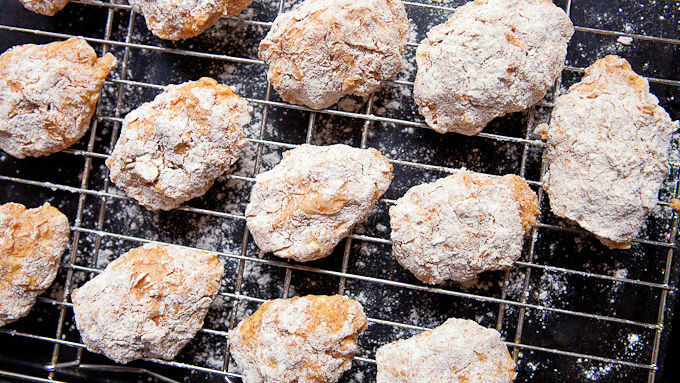 It’s actually a more flexible recipe than you might think and depending on the moisture of your chicken, you might need more or less flour. If you come over to my house for a sporting event, it’s almost a certainty that there will be wings. They're my all-time favorite game day snack. But sometimes people are put off by the bones. While I personally love the whole wings, I get it. 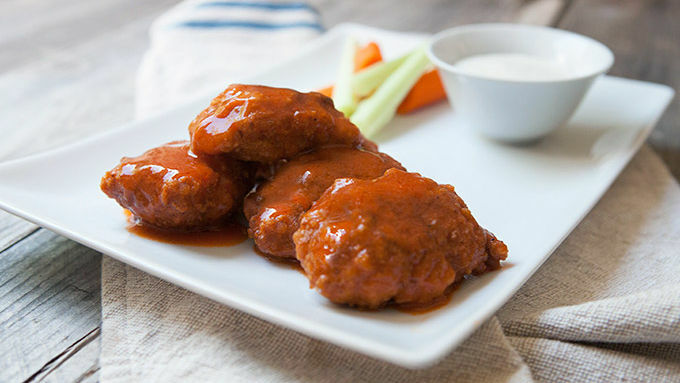 So, this is how you make the best boneless Buffalo wings – just like you get at a restaurant. 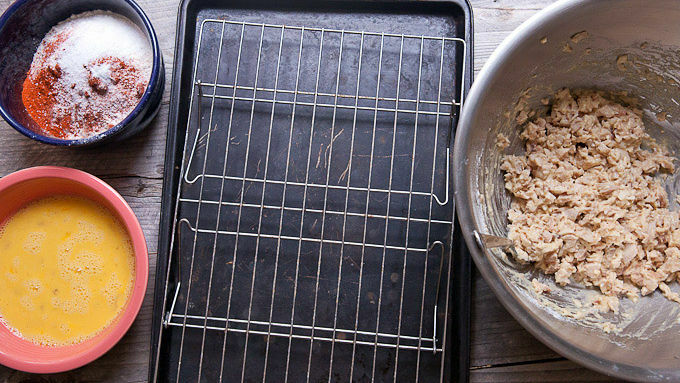 These might look like a lot of work, but it’s not that bad thanks to one big trick: Start with cooked chicken! You can either use leftover chicken you have in the fridge or buy a rotisserie chicken from your local deli and shred it up. I wrote the recipe for 8-10 oz of chicken, which is roughly 2 cups of packed, shredded chicken. But if you’re hosting a party, I highly recommend doubling it – which also happens to be about the amount of shredded chicken you’ll get off of a 3-lb bird. ?Dice the chicken pretty finely since it’s going to be in nugget form very soon. Add an egg to the mix, along with some chicken stock and flour. Season it well with salt and pepper. While I listed flour amounts in the recipe, it’s really important that you test your filling to make sure it holds together. It should be moist, but it should also hold its shape if you press it into a ball. Feel free to add more flour if needed to get it to that point. When the filling is ready, you need a breading station! I use some eggs whisked with milk and seasoned flour. 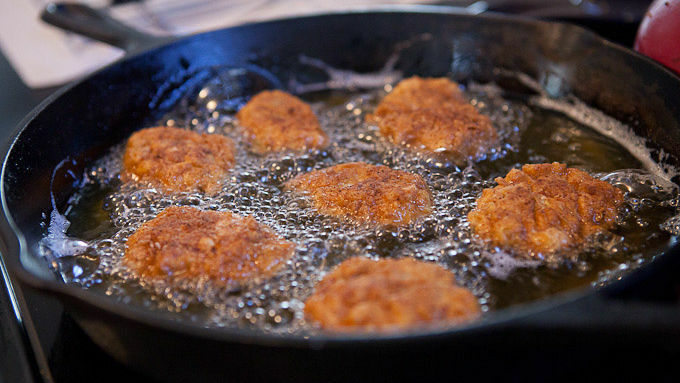 Measure out a heaping tablespoon of the filling and press it into an oblong nugget. Then dip it in the flour to dry it out, then into the egg wash, then back into the flour to form a nice crust on the nugget. Shape all the nuggets before you try to cook them. They will keep fine on a wire rack or baking sheet for a few minutes while you finish making them all. Then heat a few cups of oil in a large skillet until it reaches 350ºF. Fry the boneless wings in batches and fry them for about 3-4 minutes per side until they're nicely browned. There’s no need to have the oil completely cover the wings. You can just flip them once halfway through cooking. Let these beauties drain over a few paper towels while you finish cooking all of them. For the sauce, heat your favorite Buffalo-flavored sauce, some butter, and a small dab of tomato paste in the microwave for 20 seconds. Then toss the fried wings in the sauce while they are still warm. Serve everything up with dressing, celery and carrots to help control the heat. Then chow down!